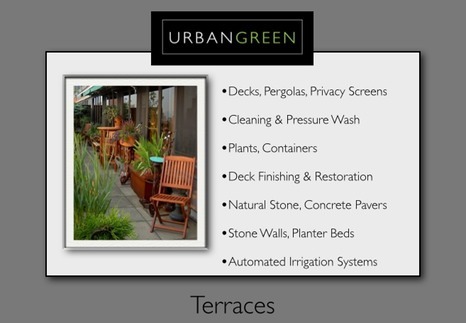 URBANGREEN can transform virtually any outdoor urban space into an oasis of green and quiet that can be a refuge from the travails of city life. �Our goal is to create a natural�environment that is�an expression of your personality; a reflection of your style and aesthetics and is functional for all of your needs. We offer a wide variety of options for your outdoor space: plantings of evergreens, trees and seasonal flowers; complete renovations including pavers and natural-stone flooring; exotic wood decks, planters, pergolas; and kitchens, outdoor showers and water features. �We use the highest quality materials and are committed to the highest standards of�craftsmanship.